This article is about Paleolithic people of the Americas. For Paleolithic people of India, see South Asian Stone Age. For other aspects of the prehistory of the Americas, see Pre-Columbian era. The Lithic peoples or Paleo-Indians are the earliest known settlers of the Americas. The period's name derives from the appearance of "lithic flaked" stone tools. Paleo-Indians, Paleoindians or Paleoamericans is a classification term given to the first peoples who entered, and subsequently inhabited, the Americas during the final glacial episodes of the late Pleistocene period. The prefix "paleo-" comes from the Greek adjective palaios (παλαιός), meaning "old" or "ancient". The term "Paleo-Indians" applies specifically to the lithic period in the Western Hemisphere and is distinct from the term "Paleolithic". Evidence suggests big-animal hunters crossed the Bering Strait from Eurasia into North America over a land and ice bridge (Beringia), that existed between 45,000-12,000 BCE (47,000-14,000 BP). Small isolated groups of hunter-gatherers migrated alongside herds of large herbivores far into Alaska. From 16,500-13,500 BCE (18,500-15,500 BP), ice-free corridors developed along the Pacific coast and valleys of North America. This allowed animals, followed by humans, to migrate south into the interior. The people went on foot or used primitive boats along the coastline. The precise dates and routes of the peopling of the New World are subject to ongoing debate. Stone tools, particularly projectile points and scrapers, are the primary evidence of the earliest human activity in the Americas. 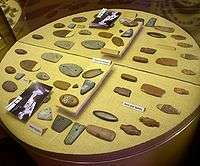 Crafted lithic flaked tools are used by archaeologists and anthropologists to classify cultural periods. Scientific evidence links Indigenous Americans to Asian peoples, specifically eastern Siberian populations. Indigenous peoples of the Americas have been linked to Siberian populations by linguistic factors, the distribution of blood types, and in genetic composition as reflected by molecular data, such as DNA. There is evidence for at least two separate migrations. Between 8000-7000 BCE (10,000-9,000 years BP) the climate stabilized, leading to a rise in population and lithic technology advances, resulting in more sedentary lifestyle. For more details on theories of Paleo-Indian migration to and throughout the Americas, see Settlement of the Americas. Map of early human migrations based on the Out of Africa theory. The specifics of Paleo-Indian migration to and throughout the Americas, including the exact dates and routes traveled, are subject to ongoing research and discussion. The traditional theory has been that these early migrants moved into the Beringia land bridge between eastern Siberia and present-day Alaska around 40,000 – 17,000 years ago, when sea levels were significantly lowered due to the Quaternary glaciation. These people are believed to have followed herds of now-extinct pleistocene megafauna along ice-free corridors that stretched between the Laurentide and Cordilleran ice sheets. Another route proposed is that, either on foot or using primitive boats, they migrated down the Pacific coast to South America. Evidence of the latter would since have been covered by a sea level rise of hundreds of meters following the last ice age. Archaeologists contend that Paleo-Indians migration out of Beringia (western Alaska), ranges from 40,000 to around 16,500 years ago. This time range is a source of debate and promises to continue as such for years to come. The few agreements achieved to date are the origin from Central Asia, with widespread habitation of the Americas during the end of the last glacial period, or more specifically what is known as the late glacial maximum, around 16,000–13,000 years before present. However, alternative theories about the origins of Paleoindians exist, including migration from Europe. Sites in Alaska (East Beringia) are where some of the earliest evidence has been found of Paleo-Indians, followed by archaeological sites in northern British Columbia, western Alberta and the Old Crow Flats region in the Yukon. The Paleo-Indian would eventually flourish all over the Americas. These peoples were spread over a wide geographical area; thus there were regional variations in lifestyles. However, all the individual groups shared a common style of stone tool production, making knapping styles and progress identifiable. This early Paleo-Indian period lithic reduction tool adaptations have been found across the Americas, utilized by highly mobile bands consisting of approximately 20 to 60 members of an extended family. Food would have been plentiful during the few warm months of the year. Lakes and rivers were teeming with many species of fish, birds and aquatic mammals. Nuts, berries and edible roots could be found in the forests and marshes. The fall would have been a busy time because foodstuffs would have to be stored and clothing made ready for the winter. During the winter, coastal fishing groups moved inland to hunt and trap fresh food and furs. Late ice age climatic changes caused plant communities and animal populations to change. Groups moved from place to place as preferred resources were depleted and new supplies were sought. Small bands utilized hunting and gathering during the spring and summer months, then broke into smaller direct family groups for the fall and winter. Family groups moved every 3–6 days, possibly covering up to 360 km (220 mi) a year. Diets were often sustaining and rich in protein due to successful hunting. Clothing was made from a variety of animal hides that were also used for shelter construction. During much of the Early and Middle Paleo-Indian periods, inland bands are thought to have subsisted primarily through hunting now-extinct megafauna. Large Pleistocene mammals were the giant beaver, steppe wisent, musk ox, mastodons, woolly mammoths and ancient reindeer (early caribou). The Clovis culture, appearing around 11,500 BCE (13,500 BP), undoubtedly did not rely exclusively on megafauna for subsistence. Instead, they employed a mixed foraging strategy that included smaller terrestrial game, aquatic animals, and a variety of flora. Paleo-Indian groups were efficient hunters and carried a variety of tools. These included highly efficient fluted style spear points, as well as microblades used for butchering and hide processing. Projectile points and hammerstones made from many sources are found traded or moved to new locations. Stone tools were traded and/or left behind from North Dakota and Northwest Territories, to Montana and Wyoming. Trade routes also have been found from the British Columbia Interior to the coast of California. The glaciers that covered the northern half of the continent began to gradually melt, exposing new land for occupation around 17,500 to 14,500 years ago. At the same time as this was occurring, worldwide extinctions among the large mammals began. In North America, camels and horses eventually died off, the latter not to reappear on the continent until the Spanish reintroduced the species near the end of the 15th century CE. As the Quaternary extinction event was happening, the Late Paleo-Indians would have relied more on other means of subsistence. From 10,500-9,500 BCE (12,500-11,500 BP), the broad-spectrum big game hunters of the great plains begun to focus on a single animal species: the bison (an early cousin of the American bison). The earliest known of these bison-oriented hunting traditions is the Folsom tradition. Folsom peoples traveled in small family groups for most of the year, returning yearly to the same springs and other favored locations on higher ground. 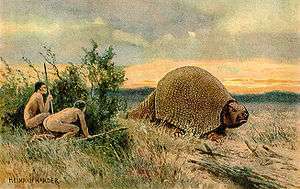 There they would camp for a few days, perhaps erecting a temporary shelter, making and/or repairing some stone tools, or processing some meat, then moving on. Paleo-Indians were not numerous and population densities were quite low. The Archaic period in the Americas saw a changing environment featuring a warmer more arid climate and the disappearance of the last megafauna. The majority of population groups at this time were still highly mobile hunter-gatherers, but now individual groups started to focus on resources available to them locally. Thus with the passage of time there is a pattern of increasing regional generalization like the Southwest, Arctic, Poverty, Dalton and Plano traditions. These regional adaptations would become the norm, with reliance less on hunting and gathering, and a more mixed economy of small game, fish, seasonally wild vegetables and harvested plant foods. Many groups continued to hunt big game but their hunting traditions became more varied and meat procurement methods more sophisticated. The placement of artifacts and materials within an Archaic burial site indicated social differentiation based upon status in some groups. 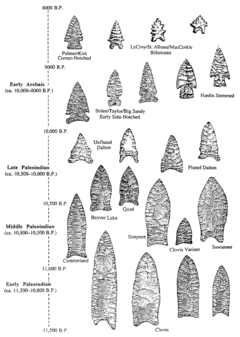 Different types of Projectile points, from the Paleo-Indian periods in the south eastern United States. Paleo-Indians are generally classified by lithic reduction or lithic core "styles" and by regional adaptations. Lithic technology fluted spear points, like other spear points, are collectively called projectile points. The projectiles are constructed from chipped stones that have a long groove called a "flute". The spear points would typically be made by chipping a single flake from each side of the point. The point was then tied onto a spear of wood or bone. As the environment changed due to the ice age ending around 17-13 Ka BP on short, and 25-27 ka BP on the long, many animals migrated overland to take advantage of the new sources of food. Humans following these animals, such as bison, mammoth and mastodon, thus gained the name big-game hunters. Pacific coastal groups of the period would have relied on fishing as the prime source of sustenance. Archaeologists are piecing together evidence that the earliest human settlements in North America were thousands of years before the appearance of the current Paleo-Indian time frame (before the late glacial maximum 20,000 plus years ago). Evidence indicates that people were living as far east as northern Yukon, in the glacier-free zone called Beringia before 30,000 BCE (32,000 BP). Until recently, it was generally believed that the first Paleo-Indian people to arrive in North America belonged to the Clovis culture. This archaeological phase was named after the town of Clovis, New Mexico, where in 1936 unique Clovis points were found in situ at the site of Blackwater Draw, where they were directly associated with the bones of Pleistocene animals. Recent data from a series of archaeological sites throughout the Americas suggest that Clovis (thus the "Paleo-Indians") time range should be re-examined. In particular, sites located near Cactus Hill in Virginia, Meadowcroft Rockshelter in Pennsylvania, Monte Verde in Chile, Topper in South Carolina, and Quintana Roo in Mexico have generated early dates for wide-ranging Paleo-Indian occupation. Some sites significantly predate the migration time frame of ice-free corridors, thus suggesting that there were additional coastal migration routes available, traversed either on foot and/or in boats. Geological evidence suggests the Pacific coastal route was open for overland travel before 23,000 years ago and after 16,000 years ago. In South America, the site of Monte Verde indicates that its population was probably territorial and resided in their river basin for most of the year. Some other South American groups, on the other hand, were highly mobile and hunted big-game animals such as mastodon and giant sloths. They used classic bifacial projectile point technology. The primary examples are populations associated with El Jobo points (Venezuela), fish-tail or Magallanes points (various parts of the continent, but mainly the southern half), and Paijan points (Peru and Ecuador) at sites in grasslands, savanna plains, and patchy forests. The dating for these sites ranges from 14,000 BP (for Taima-Taima in Venezuela) to 10,000 BP. The bi-pointed El Jobo projectile points were mostly distributed in north-western Venezuela; from the Gulf of Venezuela to the high mountains and valleys. The population using them were hunter-gatherers that seemed to remain within a certain circumscribed territory. El Jobo points were probably the earliest, going back to c. 12,980 and 14,200 BP and they were used for hunting large mammals. In contrast, the fish-tail points, dating to c. 11,000 B.P. in Patagonia, had a much wider geographical distribution, but mostly in the central and southern part of the continent. 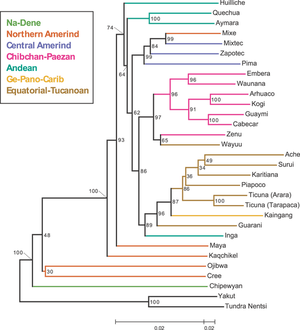 An autosomal genetic tree showing the main neighbour-joining relationships within Amerindian populations. The haplogroup most commonly associated with indigenous Amerindian genetics is Haplogroup Q-M3. Y-DNA, like (mtDNA), differs from other nuclear chromosomes in that the majority of the Y chromosome is unique and does not recombine during meiosis. This allows the historical pattern of mutations to be easily studied. The pattern indicates Indigenous Amerindians experienced two very distinctive genetic episodes; first with the initial peopling of the Americas, and secondly with European colonization of the Americas. The former is the determinant factor for the number of gene lineages and founding haplotypes present in today's Indigenous Amerindian populations. Human settlement of the New World occurred in stages from the Bering sea coast line, with an initial layover on Beringia for the founding population. The micro-satellite diversity and distributions of the Y lineage specific to South America indicates that certain Amerindian populations have been isolated since the initial colonization of the region. The Na-Dené, Inuit and Indigenous Alaskan populations, however, exhibit haplogroup Q (Y-DNA) mutations that are distinct from other indigenous Amerindians with various mtDNA mutations. This suggests that the earliest migrants into the northern extremes of North America and Greenland derived from later migrant populations. ↑ Paleolithic specifically refers to the period between approximately 2.5 million years ago and the end of the Pleistocene in the Eastern Hemisphere. It is not used in New World archaeology. ↑ Liz Sonneborn (January 2007). Chronology of American Indian History. Infobase Publishing. p. 3. ISBN 978-0-8160-6770-1. Retrieved 29 November 2011. ↑ H. Trawick Ward; R. P. Stephen Davis (1999). Time before history: the archaeology of North Carolina. UNC Press Books. p. 2. ISBN 978-0-8078-4780-0. Retrieved 29 November 2011. ↑ "Method and Theory in American Archaeology". Gordon Willey and Philip Phillips. University of Chicago. 1958. Retrieved 2009-11-20. ↑ Patricia J. Ash; David J. Robinson (2011). The Emergence of Humans: An Exploration of the Evolutionary Timeline. John Wiley & Sons. p. 289. ISBN 978-1-119-96424-7. ↑ Pitblado, B. L. (2011-03-12). "A Tale of Two Migrations: Reconciling Recent Biological and Archaeological Evidence for the Pleistocene Peopling of the Americas". Journal of Archaeological Research. 19 (4): 327–375. doi:10.1007/s10814-011-9049-y. ↑ Burenhult, Göran (2000). Die ersten Menschen. Weltbild Verlag. ISBN 3-8289-0741-5. ↑ Phillip M. White (2006). American Indian chronology: chronologies of the American mosaic. Greenwood Publishing Group. p. 1. ISBN 978-0-313-33820-5. Retrieved 29 November 2011. 1 2 Wells, Spencer; Read, Mark (2002). The Journey of Man - A Genetic Odyssey (Digitised online by Google books). Random House. pp. 138–140. ISBN 0-8129-7146-9. Retrieved 2009-11-21. ↑ Fitzhugh, Drs. William; Goddard, Ives; Ousley, Steve; Owsley, Doug; Stanford, Dennis. "Paleoamerican". Smithsonian Institution Anthropology Outreach Office. Retrieved 2009-01-15. ↑ "The peopling of the Americas: Genetic ancestry influences health". Scientific American. Retrieved 2009-11-17. ↑ Fladmark, K. R. (Jan 1979). "Alternate Migration Corridors for Early Man in North America". American Antiquity. 44 (1): 55–69. doi:10.2307/279189. JSTOR 279189. ↑ "68 Responses to "Sea will rise 'to levels of last Ice Age'"". Center for Climate Systems Research, Columbia University. Retrieved 2009-11-17. ↑ "Pleistocene Archaeology of the Old Crow Flats". Vuntut National Park of Canada. 2008. Retrieved 2010-01-10. However, despite the lack of this conclusive and widespread evidence, there are suggestions of human occupation in the northern Yukon about 24,000 years ago, and hints of the presence of humans in the Old Crow Basin as far back as about 40,000 years ago. ↑ "Journey of mankind". Brad Shaw Foundation. Retrieved 2009-11-17. ↑ Bonatto, SL; Salzano, FM (1997). "A single and early migration for the peopling of the Americas supported by mitochondrial DNA sequence data". PNAS. 94 (5): 1866–71. Bibcode:1997PNAS...94.1866B. doi:10.1073/pnas.94.5.1866. PMC 20009 . PMID 9050871. ↑ Neves, W. A.; Powell, J. F.; Prous, A.; Ozolins, E. G.; Blum, M. (1999). "Lapa vermelha IV Hominid 1: morphological affinities of the earliest known American". Genetics and Molecular Biology. 22 (4): 461. doi:10.1590/S1415-47571999000400001. ↑ Bruce Elliott Johansen; Barry Pritzker (2008). Encyclopedia of American Indian history. ABC-CLIO. pp. 451–. ISBN 978-1-85109-817-0. Retrieved 29 November 2011. ↑ "Period 1 (10,000 to 8,000 years ago)". Learners Portal Breton University. 2006. Retrieved 2010-02-05. 1 2 3 Wm. Jack Hranicky; Wm Jack Hranicky Rpa (17 June 2010). North American Projectile Points - Revised. AuthorHouse. p. 135. ISBN 978-1-4520-2632-9. Retrieved 29 November 2011. ↑ Norman Herz; Ervan G. Garrison (1998). Geological methods for archaeology. Oxford University Press. p. 125. ISBN 978-0-19-509024-6. Retrieved 29 November 2011. 1 2 3 Barry Lewis; Robert Jurmain; Lynn Kilgore (10 December 2008). Understanding Humans: Introduction to Physical Anthropology and Archaeology. Cengage Learning. pp. 342–348. ISBN 978-0-495-60474-7. Retrieved 29 November 2011. ↑ David J. Wishart (2004). Encyclopedia of the Great Plains. U of Nebraska Press. p. 589. ISBN 978-0-8032-4787-1. Retrieved 29 November 2011. ↑ Rickey Butch Walker (December 2008). Warrior Mountains Indian Heritage - Teacher's Edition. Heart of Dixie Publishing. p. 34. ISBN 978-1-934610-27-5. Retrieved 29 November 2011. ↑ Dawn Elaine Bastian; Judy K. Mitchell (2004). Handbook of Native American mythology. ABC-CLIO. p. 6. ISBN 978-1-85109-533-9. Retrieved 29 November 2011. 1 2 3 Pielou, E.C. (1991). After the Ice Age : The Return of Life to Glaciated North America (Digitised online by Google books). University Of Chicago Press. ISBN 0-226-66812-6. Retrieved 2009-11-18. ↑ David R. Starbuck (31 May 2006). The archeology of New Hampshire: exploring 10,000 years in the Granite State. UPNE. p. 27. ISBN 978-1-58465-562-6. Retrieved 29 November 2011. 1 2 Fiedel, Stuart J (1992). Prehistory of the Americas (Digitised online by Google books). Cambridge University Press. ISBN 978-0-521-42544-5. Retrieved 2009-11-18. ↑ "Alabama Archaeology: Prehistoric Alabama". University of Alabama Press. 1999. Retrieved 2010-04-10. ↑ Breitburg, Emanual; John B. Broster; Arthur L. Reesman; Richard G. Strearns (1996). "Coats-Hines Site: Tennessee's First Paleoindian Mastodon Association" (PDF). Current Research in the Pleistocene. 13: 6–8. Retrieved 2009-11-18. ↑ Catherine Anne Cavanaugh; Michael Payne; Donald Grant Wetherell (2006). Alberta formed, Alberta transformed. University of Alberta. p. 9. ISBN 978-1-55238-194-6. Retrieved 29 November 2011. ↑ McMenamin, M. A. S. (2011). "A recycled small Cumberland-Barnes Palaeoindian biface projectile point from southeastern Connecticut". Bulletin of the Massachusetts Archaeological Society. 72 (2): 70–73. ↑ Scott C. Zeman (2002). 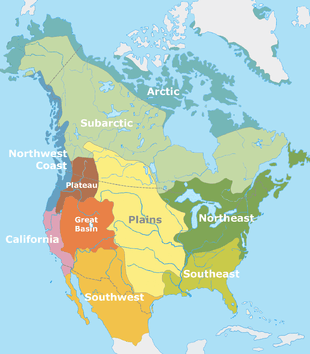 Chronology of the American West: from 23,000 B.C.E. through the twentieth century. ABC-CLIO. p. 9. ISBN 978-1-57607-207-3. Retrieved 29 November 2011. ↑ William C. Sturtevant (21 February 1985). Handbook of North American Indians. Government Printing Office. p. 87. ISBN 978-0-16-004580-6. Retrieved 29 November 2011. ↑ Emory Dean Keoke; Kay Marie Porterfield (January 2005). Trade, Transportation, and Warfare. Infobase Publishing. pp. 1–. ISBN 978-0-8160-5395-7. Retrieved 29 November 2011. 1 2 Brantingham, P. Jeffrey; Kuhn, Steven L.; Kerry, Kristopher W. (2004). The Early Upper Paleolithic beyond Western Europe. University of California Press. pp. 41–66. Retrieved 2009-11-19. ↑ "A brief history of the horse in America: Horse phylogeny and evolution". Ben Singer. Canadian Geographic. 2005. Retrieved 2009-11-18. ↑ Anderson, David G; Sassaman, Kenneth E (1996). The Paleoindian and Early Archaic Southeast (Digitised online by Google books). University of Alabama Press. ISBN 0-8173-0835-0. Retrieved 2009-11-15. 1 2 Mann, Charles C. (2006-10-10). 1491: New Revelations of the Americas before Columbus (Digitised online by Google books). Random House of Canada. ISBN 1-4000-3205-9. Retrieved 2009-11-17. ↑ "Folsom Traditions". University of Manitoba, Archaeological Society. 1998. Retrieved 2010-04-10. ↑ "Beginnings to 1500 C.E". Encyclopedia of Canada's Peoples. Retrieved 2009-11-17. ↑ "Blame North America Megafauna Extinction On Climate Change, Not Human Ancestors". ScienceDaily. 2001. Retrieved 2010-04-10. ↑ Stuart B. Schwartz, Frank Salomon (1999-12-28). The Cambridge History of the Native Peoples of the Americas (Digitised online by Google books). Cambridge University Press. ISBN 978-0-521-63075-7. Retrieved 2009-11-17. ↑ Imbrie, J; K.P.Imbrie (1979). Ice Ages: Solving the Mystery. Short Hills NJ: Enslow Publishers. ISBN 0-226-66811-8. ↑ Vance T. Holliday (1997). Paleoindian geoarchaeology of the southern High Plains. University of Texas Press. p. 15. ISBN 978-0-292-73114-1. Retrieved 29 November 2011. ↑ Adovasio, J. M., J.M. (2002). The First Americans: In Pursuit of Archaeology's Greatest Mystery. with Jake Page. New York: Random House,. p. 14. ISBN 0-375-50552-0. ↑ Wolfgang H. Berger; Elizabeth Noble Shor (25 April 2009). Ocean: reflections on a century of exploration. University of California Press. p. 397. ISBN 978-0-520-24778-9. Retrieved 29 November 2011. ↑ McHugh, Tom; Hobson, Victoria (1979). The Time of the Buffalo. University of Nebraska Press. ISBN 0-8032-8105-6. Retrieved 2009-11-17. ↑ deFrance, Susan D.; Keefer, David K.; Richardson, James B.; Alvarez, Adan U. (2010). "Late Paleo-Indian Coastal Foragers: Specialized Extractive". Latin American Antiquity. Society for American Archaeology. 12 (4): 413–426. doi:10.2307/972087. JSTOR 972087. ↑ "Alberta History pre 1800 - Jasper Alberta". Jasper Alberta. 2009. Retrieved 2009-11-20. ↑ Bradley, B. and Stanford, D. "The North Atlantic ice-edge corridor: a possible Palaeolithic route to the New World." World Archaeology 34, 2004. ↑ Lauber, Patricia. Who Came First? New Clues to Prehistoric Americans. Washington, D.C.: National Geographic Society, 2003. ↑ "National Park Service Southeastern Archaeological Center: The Paleoindian Period". Retrieved 2009-11-17. ↑ "Science News Online: Early New World Settlers Rise in East". Science News. 2000. Retrieved 2009-11-17. (subscription required (help)). ↑ "Meadowcroft Rockshelter". National Historic Landmark summary listing. National Park Service. Retrieved 2009-11-17. ↑ "Monte Verde Archaeological Site - UNESCO World Heritage Centre". Retrieved 2009-11-17. ↑ "CNN.com: Man in Americas Earlier Than Thought". 2004-11-18. Retrieved 2009-11-17. ↑ Ignacio Villarreal (2010-08-25). "Mexican Archaeologists Extract 10,000 Year-Old Skeleton from Flooded Cave in Quintana Roo". Artdaily.com. Retrieved 2010-09-17. ↑ "Skull in Underwater Cave May Be Earliest Trace of First Americans - NatGeo News Watch". Blogs.nationalgeographic.com. 2011-02-18. Retrieved 2011-03-03. ↑ "Does skull prove that the first Americans came from Europe?". The University of Texas at Austin - Web Central. Retrieved 2009-11-17. ↑ Jordan, David K (2009). "Prehistoric Beringia". University of California-San Diego. Retrieved 2010-04-15. ↑ Cummings, Vicki; Jordan, Peter; Zvelebil, Marek (2014). The Oxford Handbook of the Archaeology and Anthropology of Hunter-Gatherers. OUP Oxford. p. 418. ISBN 978-0-19-102526-6. ↑ Silverman, Helaine; Isbell, William (2008). Handbook of South American Archaeology. Springer Science. p. 433. ISBN 978-0-387-75228-0. ↑ Silverman, Helaine; Isbell, William (2008). Handbook of South American Archaeology. Springer Science. p. 35. ISBN 978-0-387-75228-0. ↑ Dillehay, Thomas D. (2008). 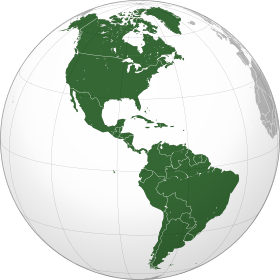 The Settlement of the Americas. Basic Books. p. 209. ISBN 978-0-7867-2543-4. ↑ "Y-Chromosome Evidence for Differing Ancient Demographic Histories in the Americas" (PDF). University College London 73:524–539. 2003. Retrieved 2010-01-22. ↑ Orgel L (2004). "Prebiotic chemistry and the origin of the RNA world" (PDF). Crit Rev Biochem Mol Biol. 39 (2): 99–123. doi:10.1080/10409230490460765. PMID 15217990. Retrieved 2010-01-19. ↑ Wendy Tymchuk, ed. (2008). "Learn about Y-DNA Haplogroup Q" (Verbal tutorial possible). Genebase Systems. Retrieved 2009-11-21. ↑ Wendy Tymchuk, ed. (2008). "Learn about Y-DNA Haplogroup Q". Genebase Systems. Archived from the original (Verbal tutorial possible) on 2010-04-21. Retrieved 2009-11-21. ↑ "Pause Is Seen in a Continent's Peopling". New York Times. 13 Mar 2014. ↑ Than, Ker (2008). "New World Settlers Took 20,000-Year Pit Stop". National Geographic Society. Retrieved 2010-01-23. ↑ "Summary of knowledge on the subclades of Haplogroup Q". Genebase Systems. 2009. Retrieved 2009-11-22. ↑ Ruhlen M (November 1998). "The origin of the Na-Dene". Proceedings of the National Academy of Sciences of the United States of America. 95 (23): 13994–6. Bibcode:1998PNAS...9513994R. doi:10.1073/pnas.95.23.13994. PMC 25007 . PMID 9811914. ↑ Zegura SL, Karafet TM, Zhivotovsky LA, Hammer MF (January 2004). "High-resolution SNPs and microsatellite haplotypes point to a single, recent entry of Native American Y chromosomes into the Americas". Molecular Biology and Evolution. 21 (1): 164–75. doi:10.1093/molbev/msh009. PMID 14595095. ↑ Saillard, Juliette; Forster, Peter; Lynnerup, Niels; Bandelt, Hans-Jürgen; Nørby, Søren (2000). "mtDNA Variation among Greenland Eskimos. The Edge of the Beringian Expansion". Laboratory of Biological Anthropology, Institute of Forensic Medicine, University of Copenhagen, Copenhagen, McDonald Institute for Archaeological Research, University of Cambridge, Cambridge, University of Hamburg, Hamburg. Retrieved 2009-11-22. ↑ Torroni, A.; Schurr, T. G.; Yang, C. C.; Szathmary, E.; Williams, R. C.; Schanfield, M. S.; Troup, G. A.; Knowler, W. C.; Lawrence, D. N.; Weiss, K. M.; Wallace, D. C. "Native American Mitochondrial DNA Analysis Indicates That the Amerind and the Nadene Populations Were Founded by Two Independent Migrations". Center for Genetics and Molecular Medicine and Departments of Biochemistry and Anthropology, Emory University School of Medicine, Atlanta, Georgia. Genetics Society of America. 1992. Vol 130, 153-162. Retrieved 2009-11-28. Jablonski, Nina G (2002). The First Americans: The Pleistocene Colonization of the New World. California Academy of Sciences. ISBN 0-940228-49-1. Peter Charles Hoffer (2006). The Brave New World: A History of Early America. JHU Press. ISBN 978-0-8018-8483-2. Meltzer, David J (2009). First peoples in a new world: colonizing ice age America. University of California, Berkeley. ISBN 0-520-25052-4. Wikimedia Commons has media related to Paleoindian. The Paleoindian Database - The University of Tennessee, Department of Anthropology.